Background image courtesy of NorthSouthNews.com, modified by me. Click image to enlarge. 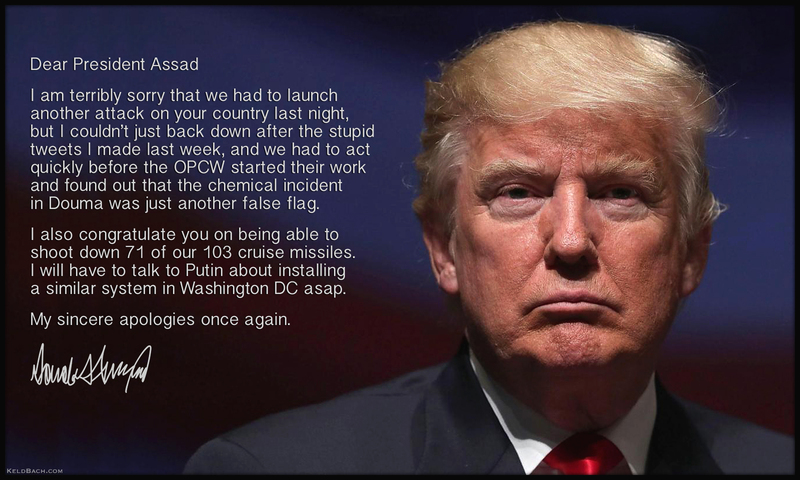 This entry was posted in Humour & Satire, Imperialism & Colonialism, Photography & Art, War & Terror and tagged Bashar al-Assad, Donald Trump, Syria, USA. Bookmark the permalink. Aw, how sweet. If he actually sent a note like this, they wouldn’t just give him a black eye like they did George W – they would kill him. Trump’s approval rating went up to 51 percent after the attack – just like it did last time. Sadly, it pays off in the eyes of many Americans to be tough, and Trump seems to have learnt that lesson now.